White kidney bean extract may help you lose weight by blocking the absorption of carbohydrates, which is why it's often called a carb blocker or starch blocker. While the extract can cause gastrointestinal side effects, they should go away after your body adjusts to the supplement. 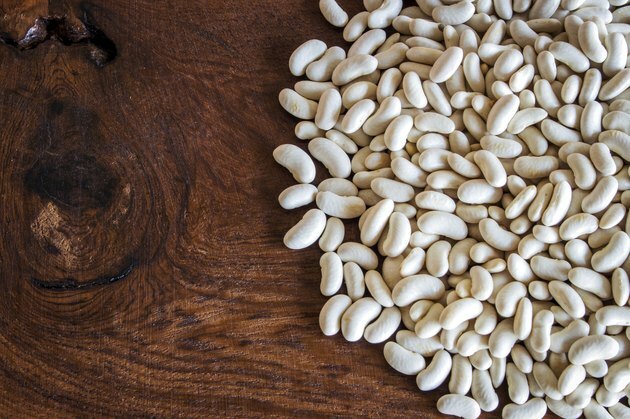 It can also affect blood sugar or interact with medications used to treat blood sugar, so talk to your health care provider before taking white bean extract, especially if you have diabetes. White kidney beans naturally produce substances called alpha-amylase inhibitors. Once inside your body, these inhibitors block amylase, which is the enzyme responsible for breaking down carbohydrates in your small intestine. Carbs that aren't broken down can't be absorbed through the wall of the small intestine into your bloodstream, so they continue traveling through your digestive tract until they're fermented by bacteria in the large intestine. This amylase-blocking activity may help you lose weight since it reduces the amount of carbs -- and, as a result, calories -- that enter your system. Extracts from white kidney beans do not generally cause any serious side effects. You may experience some gas and diarrhea due to the increased fermentation of carbohydrates. Bloating and constipation have also been reported, according to a review of the research published in the March 2011 issue of the "Nutrition Journal." All of the side effects disappeared after the supplements were consistently consumed for a few days. These temporary gastrointestinal problems are similar to what you may encounter if you suddenly increased the amount of fiber in your diet. If you're allergic to legumes, do not take white bean extract. Also be aware that amylase inhibitors may be extracted from wheat, which would not be a safe alternative if you have wheat allergies. Women who are pregnant or breast-feeding and those with kidney or liver disease should consult their health care provider before using white bean supplements. Amylase inhibitors may lower levels of blood sugar. For this reason, they may not be safe if you take medications to regulate blood sugar or you have diabetes or hypoglycemia. In its review of the studies published to date, the "Nutrition Journal" reported the amount of weight lost by subjects in studies published between 2007 and 2010. In three separate studies, participants who took white bean extract lost 4 pounds over eight weeks, 6.5 pounds over four weeks and 7 pounds after taking supplements for 12 weeks. The subjects in each study who took plain sugar tablets either stayed at the same weight or gained 1 pound. Another review in the "British Journal of Nutrition" in July 2011 concluded that six clinical trials had quality issues and that more research is needed to verify the effectiveness of white bean extract. Is White Kidney Bean Extract Good for Weight Loss?